A couple of days ago I talked about how baking supply sales tend to lay low until holidays roll around. Easter is the perfect time to stock up! 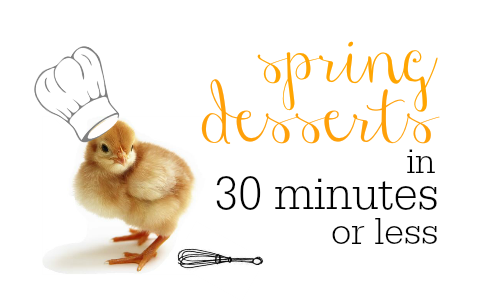 So, in honor of baking supplies currently being on sale, I thought it might be fun to share some spring-inspired and weeknight ready desserts that are quick and yummy. These happy dessert recipes I’ve found can each be made in 30 minutes or less. They’d be great for whipping up after dinner or quickly putting together for pop-up company. Just thinking about these sweet treats makes me want to get comfortable on my porch on a sunny and fragrant spring day! This is also a great week to make my all time favorite Mandarin Pineapple Dream. Grab BOGO pineapple and Cool Whip at Publix or Bi-lo and you’ve dessert for super cheap.